† Scott starts the Kosovo Republic with this issue (not found in Gibbons) numbering contiguously from the UNMIK issues. ‡ Gibbons begins with this 2009 issue, SG118, numbering from the 1913 Kingdom issues..
"Kosovo was part of the Ottoman Empire from the 15th to the early 20th century. In the late 19th century, Kosovo became the centre of the Albanian national awakening. Following their defeat in the Balkan Wars, the Ottomans ceded Kosovo to Serbia and Montenegro. Both countries joined Yugoslavia after World War I, and following a period of Yugoslav unitarianism in the Kingdom, the post-World War II Yugoslav constitution established the Autonomous Province of Kosovo and Metohija within the Yugoslav constituent Republic of Serbia. Tensions between Kosovo's Albanian and Serb communities simmered through the 20th century and occasionally erupted into major violence, culminating in the Kosovo War of 1998 and 1999, which resulted in withdrawal of Serbian armed forces and establishment of the United Nations Interim Administration Mission in Kosovo. 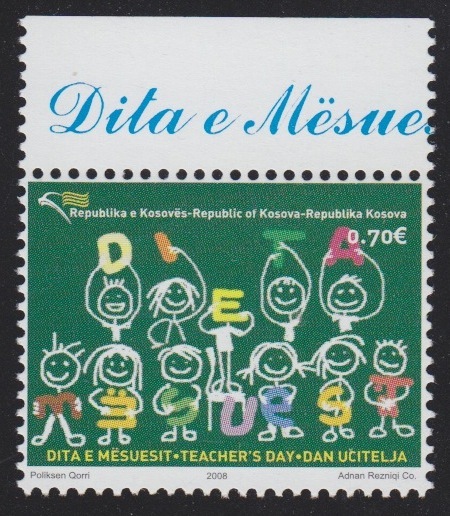 On 17 February 2008, Kosovo unilaterally declared its independence from Serbia. It has since gained diplomatic recognition as a sovereign state by 111 UN member states, Serbia refuses to recognize Kosovo as a state.although with the Brussels Agreement of 2013, it has accepted the legitimacy of its institutions." Stamps were issued by the United Nations Interim Administration Mission (U.N.M.I.K.) and the Posts & Telecommunications of Kosovo, beginning on 14th March 2000. They were for local use for the first two months and for international use from May 2000. Sources: ScS, SGS (2012), Wikipedia [accessed 15Aug17].